If you missed the live streaming, the documentary is up all the time online! So, about that summer schedule. We have bigger things on our plate. As you all know, the Supreme Court is set to rule on Fisher v. Texas before the end of June. As enrollment management pros, it would make sense that we (you) have a vested interest in the outcome, as should all of America. 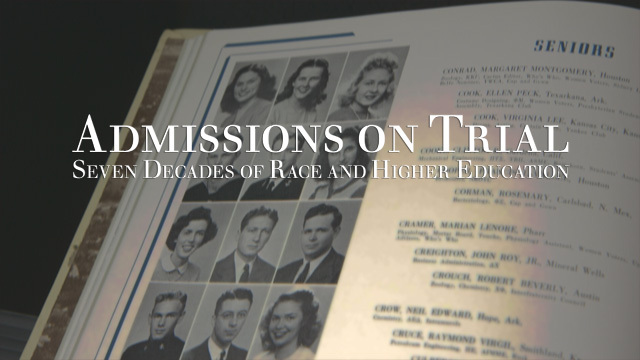 I'm sure you saw Jennielle's tweets the other night regarding a documentary that was recently released, Admissions on Trial: Seven Decades of Race and Higher Education, and we'd really love to incorporate this into an overarching discussion on affirmative action and the court's ruling. THIS Thursday (6/20) we'll be having a virtual viewing party of the documentary. It seems like it was made for #EMchat because it's just under an hour. Thanks to PBS-KLRU in Austin, we've been set up with an OVEE account to view the documentary, with chat included - Click here! Feel free to use #EMchat and #AdmissionsTrial as well on Twitter. I'll be tweeting takeaways/facts throughout the documentary on Twitter AND participating in the OVEE. We'd also love for you all to submit questions to us this week regarding the documentary and overall case that we can present to the documentary's writer, director, producer, Lynn Boswell. We'll pull these together for a Q & A blog post. Our 6/27 chat will be replaced with a Reactions Chat centered around the decision. We'll likely take some of the questions received throughout the week and rework them into a chat format. We're really excited about this and we're pumped to be working with Lynn to make this a reality. Click on the Evite below to join the viewing party. We won't have any questions scheduled, but I'm sure there will be plenty of thoughts! We'd love to know who's coming, so please RSVP!